If this is your first time working with Elie Design, making your first custom jewelry, you may have a few questions before you begin the process. Below are some of the most frequently asked questions. If you don’t see your question here you can get in touch with us. What is the cost for my custom design piece? Every piece starts off as a brand new idea based on your desire and your available materials. Because of that, it is important to first know more about what you have in mind for this creation. The fasted way to get an estimate on your new gem is to start a consultation with us. The information we collect will allow us to provide you with a general quote quickly. Once we determine the finer details of design, materials used, which items provided by you, etc., we can offer you an exact price. Is custom jewelry more expensive? Our custom made jewelry is priced similar to fine quality jewelry pieces that are mass produced, but you receive a piece that is uniquely yours and was designed with and for you! At Elie Jewelers everything is done right here in house in our Yelm Store workshop, making the process simple, fast and cost efficient. Do you send out any work? While every job is different, most of all work is done right here in-house. We design, cast and set the stones here in our Yelm shop. 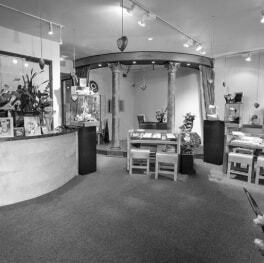 With over 25 years of experience in jewelry making, design and repair, combined with a state of the art “little” workshop there is no task too big or too small for us to handle. We can manufacture a simple piece in less than 2 weeks if needed. More complex designs (and during busy season) can take up to 6 weeks. Our projects, on average, take about 4-5 weeks to complete.That includes the initial consultation, discussing your ideas and defining the details, producing the 3D models, around 3 weeks of production time. That includes the initial consultation, discussing your ideas and defining the details, producing the 3D models, around 3 weeks of production time. If you need a piece completed by a certain date, let us know up front, and we’ll see if we can accommodate your request. In certain cases, we offer a rush service that expedites your request to guarantees your delivery date. How do I know that I like the piece when it is finished? You are involved with the design process in the initial meeting. After that we show you CAD images and waxes for approval. You are actually able to make changes before the product is even close to finished. After that, we start casting, stone setting and the final finishing touches. Throughout the process our goal is to make sure you love the piece. How do you design Jewelry? When you start a consultation with us, we start discovering what piece of jewelry you want to create then we help you with the details of your design. Depending on the scope of the project we might create a sketch or a 3-D CAD rendering of the finished piece. Other pieces get created by hand fabrication utilizing your jewelry, our skill and other items. Where are you located? Who makes your jewelry? We are located in Yelm in the South Puget Sound area, south of Seattle, Washington. Most of our creations get crafted right here in Yelm by Margarette and Stefan Elie. We mostly create jewelry for our local customers from Seattle, Washington to Portland, Oregon but we also create and ship jewelry to our loyal customers in San Francisco, New York, and nationwide. Can I see a design before I pay? The initial consultation is free of charge. However before we produce 3D previews of your piece, we require a deposit up front – this deposit goes toward the final cost of producing your piece. Should you decide not to proceed with production of your design, the deposit is partially refundable minus an amount we retain to cover our designer’s time. Can I use my own diamonds in the new design? Actually, we encourage you to bring your own pieces of family jewelry from which we then can use the stones to design a new piece that incorporates the beloved items from the family. As long as your stones are in good condition we can use your own diamonds and gemstones to incorporate the energy of your heirloom pieces in the new design, as well as lower the price. We often create the new ring or pendant after measuring your stones. The new piece then gets built around the stone. Can I have my own gold reused in the new custom piece? In some case we can fabricate a new design by utilizing your jewelry but when we cast a new piece it is not recommended to use the metal from the old jewelry. Gold jewelry can consist of many different alloys and there is no way to control the quality of the new piece if we do not know the composition of your old gold jewelry. Usually we cast your new piece with clean casting gold alloys from a reputable source. We can take in your old jewelry for “scrap value” credit which will be applied towards the project. We can work with all fine metals. Most of the time our creations are made of 14 karat or 18 karat White Gold, Yellow Gold, Rose Gold, or Sterling Silver. We also cast pieces in Platinum or Palladium. because we have several Laser welders in our workshop. Do you offer conflict-free diamonds? We only work with diamond dealers who guarantee their diamonds are sourced under Kimberly rules. 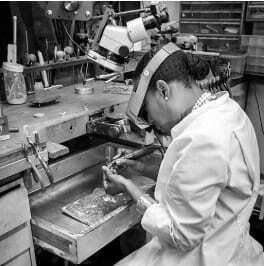 The Kimberly process was set up to guide and monitor the Diamond industry and insures that the diamonds are conflict free. Conflict-free diamonds are stones mined, cut, polished and distributed in ethical ways, whose profits do not fund war, terrorism the drug trade or other criminal activity. When we create a custom piece for you we make sure in the design phase that you are happy with all aspects of the piece and we don’t start production until after your final approval of all the details of the design. Each of our jewelry designs are custom crafted and cannot be returned for a refund, and projects cannot be cancelled once we have begun production. The best way to begin the process for your own custom piece of jewelry is to set up an appointment with a member of our experienced sales staff. Bring in any designs, pieces or ideas that you would like to use. From there, we will guide you in the right direction and give you a price for your piece. It is just that easy! Call us at 360-458-5758 or email us.